The Resources and Energy Quarterly contains the Office of the Chief Economist’s forecasts for the value, volume and price of Australia’s major resources and energy commodity exports. A ‘medium term’ (five year) outlook for Australia’s major resource and energy commodity exports is published in the March quarter edition of the Resources and Energy Quarterly. The June, September and December editions contain a ‘short term’ (two year) outlook. 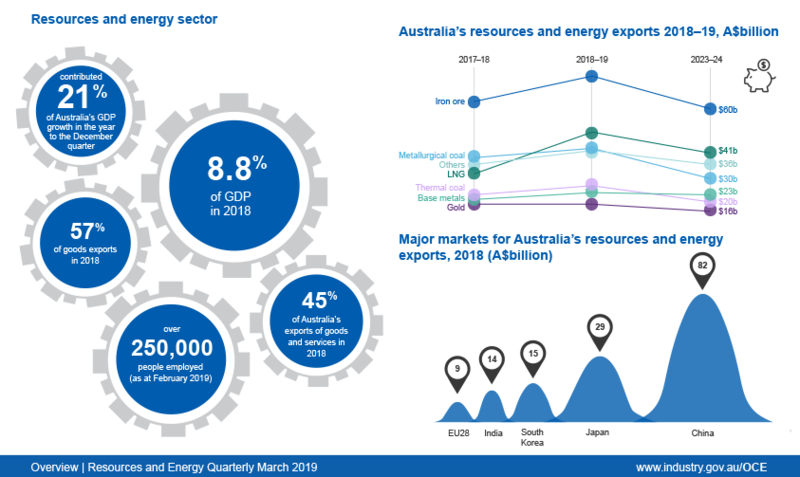 The December quarter edition of the Resources and Energy Quarterly also includes a feature chapter and data on Australia’s resources and energy major projects. Underpinning the forecasts contained in Resources and Energy Quarterly is the Office of the Chief Economist’s outlook for global commodity prices, demand and supply. The forecasts for Australia’s commodity exporters are reconciled with this global context. The global environment in which Australia’s producers compete can change rapidly. 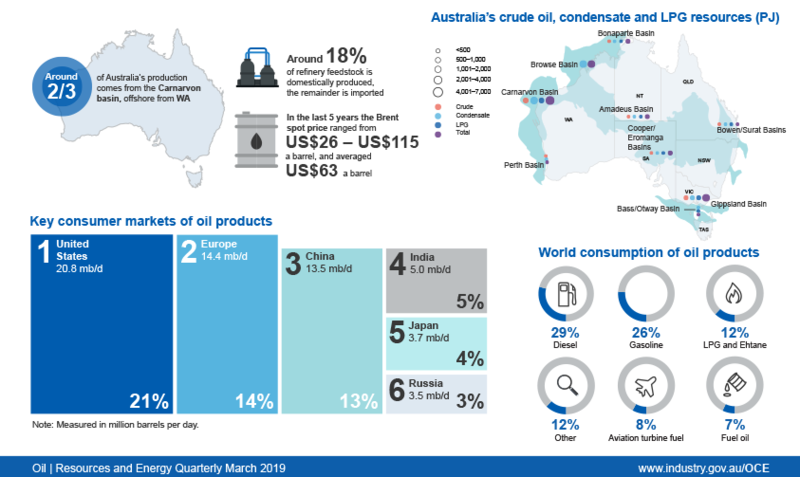 Each edition of Resources and Energy Quarterly factors in these changes, and makes appropriate alterations to the outlook, estimating the impact on Australian producers and the value of their exports. Commodity markets sit at the heart of the global economy, providing the raw materials that make everything else work. This means commodity markets are subject to an unusually large number of influences, being connected to almost every significant change in the global economy. 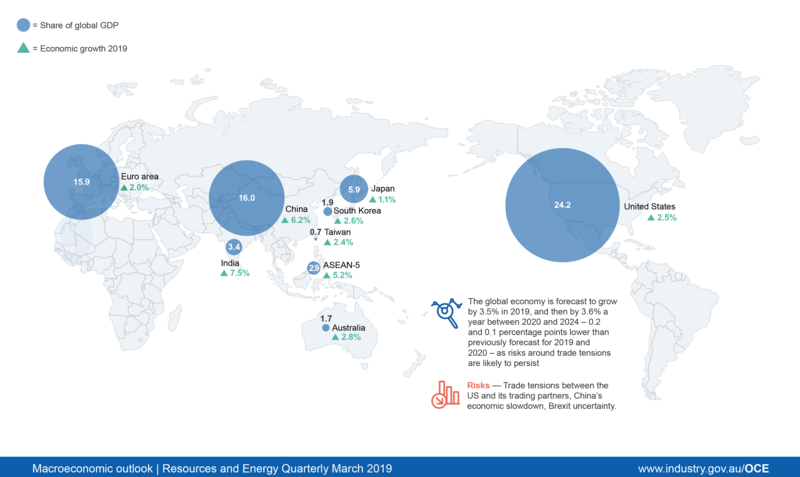 Each March we publish an extended (five rather than two-year) outlook, which tries to draw out some of the longer-term, structural changes in commodity markets, and unpick the many linkages to the global economy at large. The big picture view from this quarter’s review suggests that supply disruptions are likely to be the primary story in the short-term, with demand changes increasingly important the further out we look. Recent months have seen some significant supply shocks in commodity markets. The largest of these by far is the collapse of Vale’s Brumadinho mine tailings dam in Brazil, which will lead to a sharp drop in iron ore exports from South America. Australian producers stand to gain, both as prices rise to reflect lower seaborne supply and as new opportunities emerge in a more supply-constrained iron ore market. This has improved prospects for the Australian iron ore sector and led to a sizeable upward revision to resource export values, which are now expected to top $278 billion in 2018–19. As global commodity supply improves, and if the consensus forecast for gains in the Australian dollar is correct, exports are likely to drift lower, down to about $227 billion (in real terms) by 2023–24. Some of the current supply outages will not favour Australia. Huge rainfall and other weather-related problems in Queensland have disrupted a few mines, rail-lines and a port, with notable impact on metallurgical coal. As metallurgical coal is used to make steel, this brings further uncertainty into iron ore markets, adding to the problems of some coal exporters. Copper production has faced disruption in some countries, mainly due to smelter maintenance, while key oil producers such as Venezuela, Libya and Iran continue to face geopolitical problems. The scale and variety of supply disruptions at work now is likely to drive big swings in commodity prices and inventory levels over the next few years. As we move towards the end of the 5-year outlook period, demand pressures are likely to play a greater role in price and volume swings. Growth in commodity demand has already slowed: partly as a result of a cyclical slowdown in world industrial production growth, and partly due to trade tensions and a softer economic outlook in China. The latter is leading to a long-awaited diversification in commodity demand, with a greater share of commodity use now occurring in India and ex-China Asia. Any escalation in trade tensions between China and the US will likely accelerate this diversification, as US tariffs potentially push production out of China and into other countries. Some of these are nearby countries that could be supplied by Australia, such as Vietnam, Thailand, Indonesia, and Taiwan. Trade tensions remain the largest risk to commodity markets, but a deeper than expected downturn in the global growth cycle — now in its 9th year — is also a potential hazard. Technological change has always shaped commodity demand, and the next five years are likely to deepen this link. The emerging commodities will probably be those with connections to wireless and automotive technology, low-carbon energy, and power storage. In the near-term outlook, most of the story relates to supply. In the longer term, two trends are worth watching. One is geographic, with a rapid shift now underway towards India and emerging Asia. The other is technological, and linked to global efforts on climate change and the emergence of new consumer technologies. The greatest long-term rewards will flow to the commodity producers who can spot the opportunities presented by these trends and capture them. The prices of Australia’s major resource commodities have recently hit 7-year highs, but are likely to drift lower after 2018–19 due to softer demand and rising supply. Supply problems — primarily in other producing nations — have pushed up commodity prices in 2019. The price gains are such that, combined with a weaker than expected exchange rate, Australia’s resource and energy exports are set to hit a new record high of $278 billion in 2018–19, before falling back over the next five years. Volumes of Australia’s resource and energy exports are forecast to level out after 2021–22. The global economy is forecast to grow by 3.5 per cent in 2019, and then by 3.6 per cent a year between 2020 and 2024. Near term global GDP growth is likely to be affected by trade tensions between the US and its trading partners, and an economic slowdown in China. The outlook is also impacted by the risks of a potential no-deal withdrawal of the United Kingdom from the European Union. Economic growth in the United States is expected to moderate from the very strong growth rates of 2018, due to tightened monetary conditions. In China, domestic economic growth is expected to slow, due to ongoing trade tensions with the US. The UK and Eurozone economies are forecast to slow, due to Brexit uncertainty and fiscal/debt problems in Italy. World steel production and consumption projected to increase, but at a slower pace over the next five years. In 2018, world steel production was lifted by strong economic growth, a pickup in industrial production, and robust production in China. 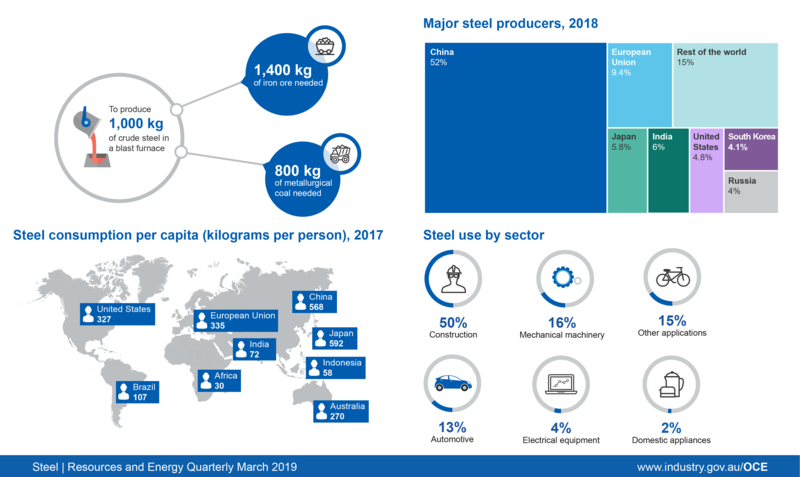 China’s steel production and consumption is projected to gradually decline over the outlook period, reflecting a slow-down in construction activity, stricter environmental policies and supply-side reforms. India and other emerging economies are expected to increasingly drive growth in world steel consumption and production. The FOB Australia iron ore price has been revised up to average US$67 a tonne in 2019, following significant Brazilian mine closures — due to the Brumadinho dam collapse in that country. As a result, Australia’s real iron ore export earnings are forecast to increase from $63 billion in 2017–18 to $74 billion in 2018–19. The real iron ore price is subsequently projected to decline to average US$58 a tonne (FOB Australia) in 2024, as steel production falls in China and the seaborne iron ore market returns to balance. Real iron ore export earnings are projected to decrease to $67 billion by 2023–24,as a result of the projected decline in prices. 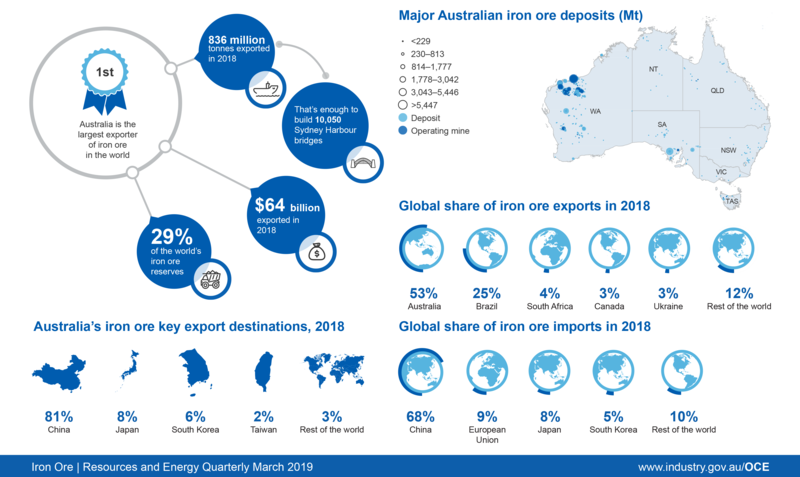 The volume of Australia’s iron ore exports is projected to rise from 848 million tonnes in 2017–18 to 902 million tonnes in 2023–24, supported by large scale producers ramping up to long term production targets. 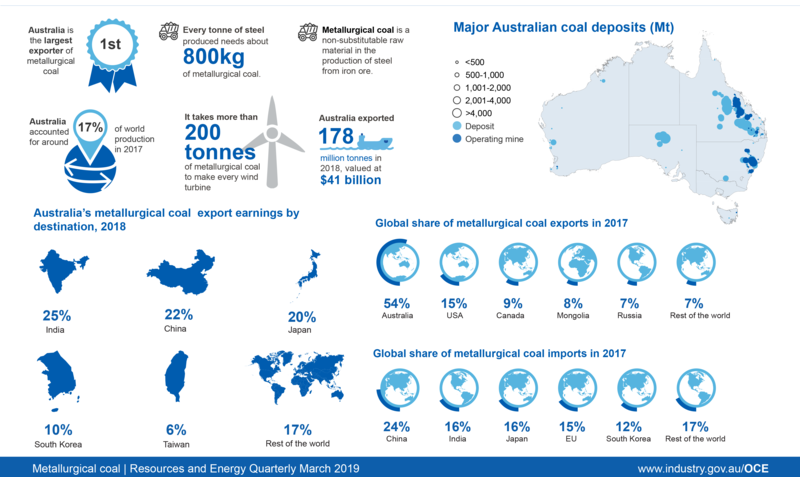 Australia’s metallurgical coal export earnings forecast to reach record highs in 2018–19. 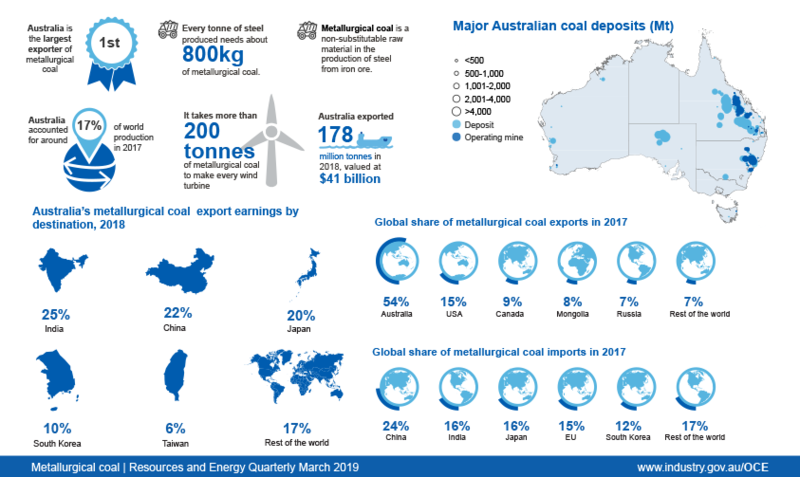 Australia’s metallurgical coal export earnings are forecast to increase in real terms, from $39 billion in 2017–18 to a new record of $43 billion in 2018–19. A forecast decline in the price is expected to drive real export earnings down to $30 billion in 2023–24. Supply growth and softening demand are expected to reduce the premium HCC spot price from an average of US$212 a tonne in 2018 to US$150 in 2021, in real terms. The price is then projected to bottom out and recover modestly to US$159 a tonne in 2024, driven by a tightening market. Australia’s export volumes are forecast to grow from 179 million tonnes in 2017–18 to reach 203 million tonnes in 2022–23, before receding back to 198 million tonnes in 2023–24. This reflects an expected recovery from supply disruptions and modest production growth, before the impact of several mine depletions take effect. Australia’s thermal coal export earnings forecast to reach record highs in 2018–19. 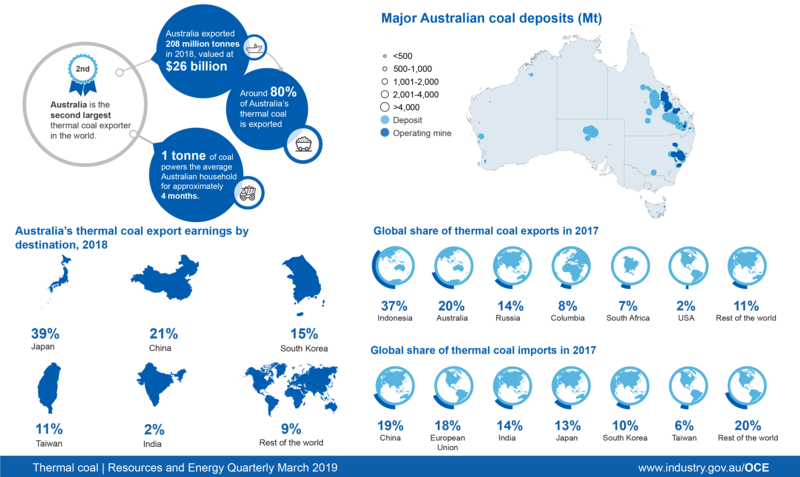 Australia’s thermal coal export earnings are forecast to reach a new record of $27 billion in 2018–19, up from an existing record $23 billion in 2017–18, driven by strong prices. Export earnings are forecast to decline (in real terms) to $20 billion by 2023–24, as the impact of lower prices offsets higher export volumes. The Newcastle benchmark spot price is forecast to decline from an average of US$108 a tonne in 2018 to US$76 a tonne in 2021, in real terms, as supply growth outpaces demand. The price is then expected to recover modestly to reach US$82 a tonne by 2024, as a lack of new projects constrains world supply. Australia’s export volumes are forecast to grow from 203 million tonnes in 2017–18 to 225 million tonnes by 2023–24, reflecting production growth from new capacity and expansions, fewer production disruptions, and productivity improvements. Australia’s LNG export earnings are forecast to top $50 billion in 2018–19, as Australia once again overtakes Qatar as the world’s largest exporter of the liquefied fuel. 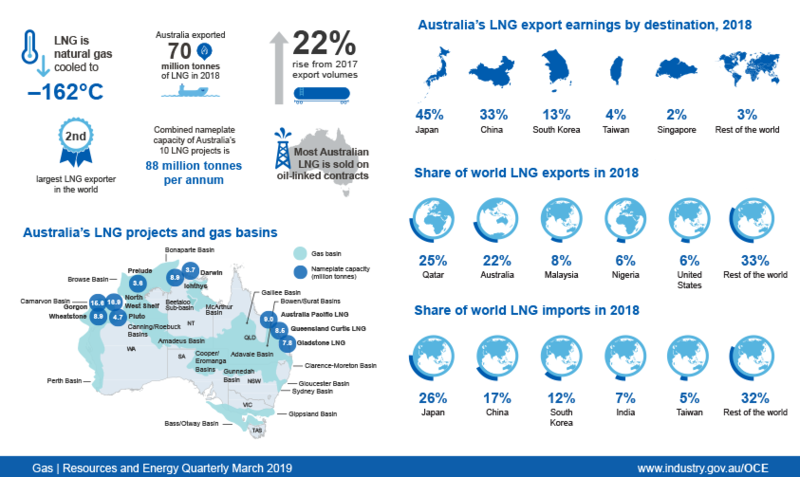 The real value of Australia’s LNG exports is forecast to increase from $32 billion in 2017–18 to a peak of $51 billion in 2019–20, before slowly declining as export volumes stabilise and prices ease. In 2023–24, real LNG export earnings are projected to be $41 billion. 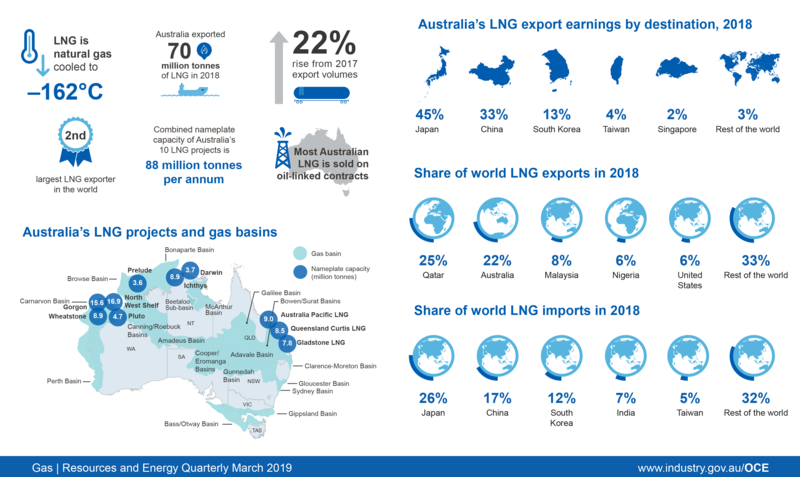 Australia’s LNG export volumes are forecast to increase from 62 million tonnes in 2017–18 to 82 million tonnes in 2019–20, as the final two projects in Australia’s recent wave of LNG investment ramp up production. LNG contract prices — at which most Australian LNG is sold — are forecast to edge down after 2018–19, as oil prices ease. LNG spot prices are also expected to decline in the short term, before recovering in the early 2020s as the global LNG market tightens. In 2019, oil prices are expected to average US$69 a barrel, as OPEC and Russian production declines. Over the medium term, strong growth in US shale oil supply is likely to drive prices lower. Australia’s oil export volumes are projected to increase — as a side effect of big new LNG projects coming online — and peak in 2020–21. Annual real earnings from oil exports are expected to rise from $7.1 billion in 2017–18 to peak at $11 billion in 2019–20, before declining to a projected $7.9 billion in 2023–24. Uranium spot prices appear to be on a sustained recovery, with further lifts at the start of 2019. This growth is expected to continue, with prices rising in real terms to be above US$40 a pound by 2024. Uranium production in Australia is expected to decline over the outlook period, as output winds down at the Ranger mine — which is due to close before 2021. 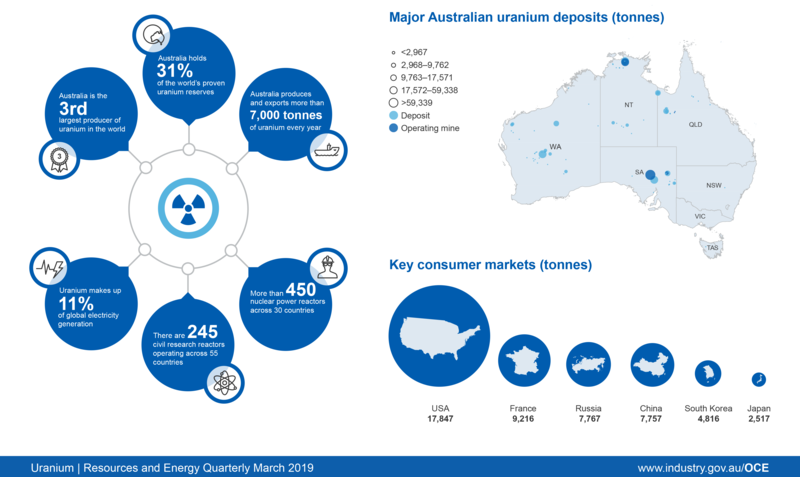 Australia’s uranium export earnings are expected to fall in real terms, from $665 million in 2017–18 to $547 million by 2023–24, with lower production offsetting the benefits of higher prices. Gold prices are projected to rise gradually over the next five years, to an average US$1,428 an ounce (in real terms) in 2024, as gold’s status as a safe haven asset fuels investor demand over the short term and world mine supply declines from 2020. 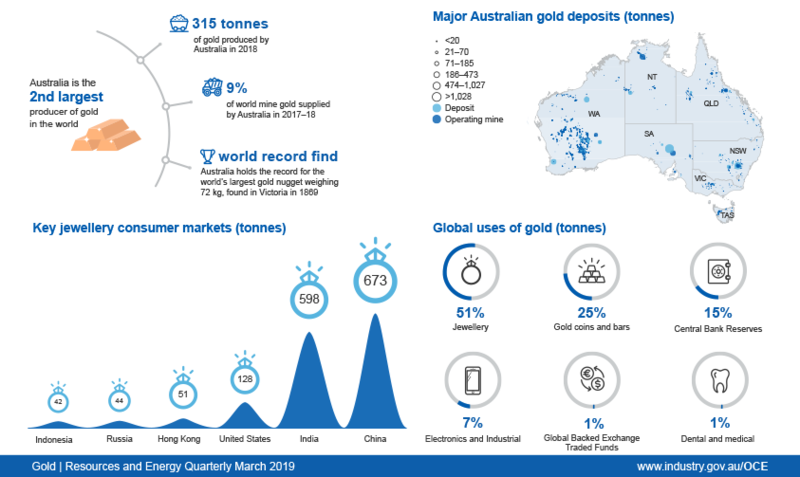 World gold production is projected to fall after 2020, as some long and large established mine projects in Australia and other major gold producing countries reach life end. The value of Australia’s gold exports is forecast to peak in 2019–20 at nearly $22 billion (in 2018–19 dollar terms), driven by higher prices and export volumes. Export values are projected to decline to $16 billion by 2023–24, due to lower domestic production and export volumes. After averaging US$2,161 a tonne in 2018, aluminium prices are projected to remain broadly stable over the next five years. With supply problems easing, alumina prices are projected to fall back in real terms, from US$483 a tonne in 2018 to US$360 a tonne in 2024. 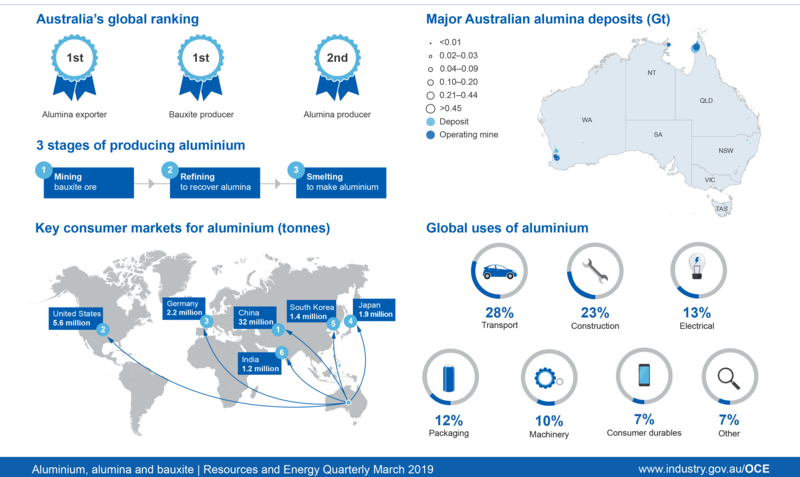 Australia’s aluminium and alumina exports are expected to be steady through to 2023–24, at 1.4 million tonnes and over 18 million tonnes per annum, respectively. Bauxite exports are forecast to increase from 30 million tonnes in 2017–18 to 36 million tonnes in 2023–24. Total Australian export earnings for aluminium, alumina and bauxite are forecast to decline in real terms, from $14 billion in 2018–19 to $13 billion in 2023–24, reflecting a decline in alumina prices. Copper prices are currently relatively low, at around US$6,300 per tonne. With inventories near record lows, prices are expected to rise significantly, to just under US$7,000 in 2019 (in real terms). The price should peak at around US$8,500 by 2021, before easing back in subsequent years. Australia’s copper exports are forecast to rise from 894,000 tonnes in 2017–18 to around 1.1 million tonnes (in metal content terms) by 2023–24, driven by rising supply from new and existing mines. 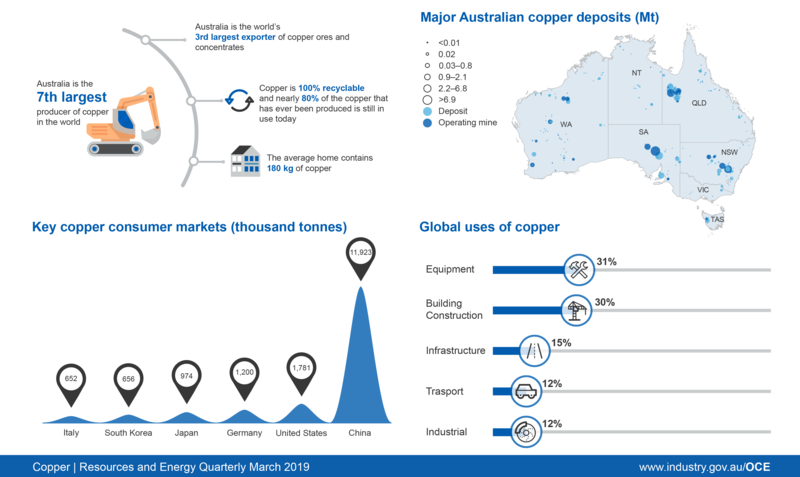 Australia’s real copper export earnings are forecast to lift in real terms, from $8.6 billion in 2017–18 to $10.8 billion by 2034–24. Driving export earnings will be strong prices and rising production at several new mines. 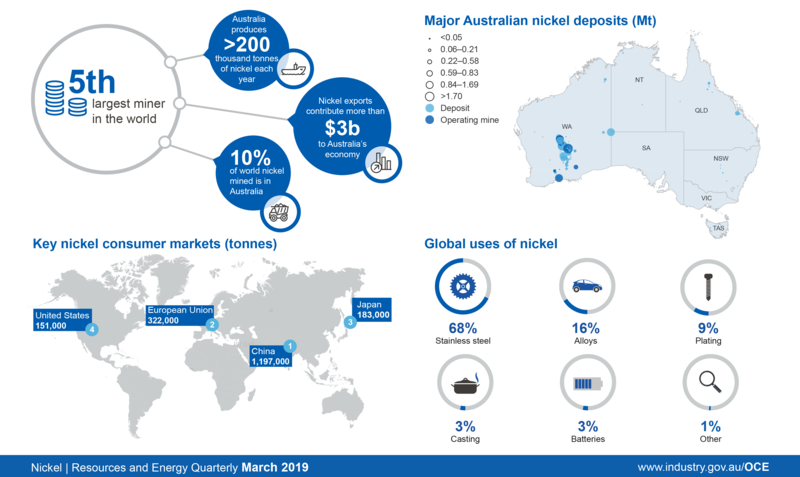 Nickel prices fell to under US$12,000 a tonne in the first quarter of 2019. Prices are expected to lift gradually, averaging US$12,725 in 2019 and just over $US14,000 (in real terms) by 2024. 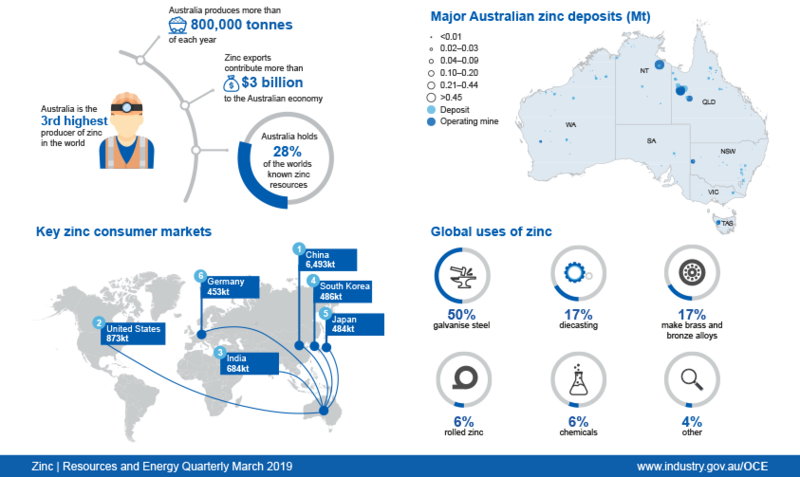 Several new mines in Western Australia and a significant upgrade to the Kwinana nickel refinery, should see Australia’s primary and refined production rise — with refined output set to increase from 167,000 tonnes in2018–19 to 290,000 tonnes by 2023–24. Total nickel export earnings are forecast to rise from $3.2 billion in 2018–19 to $4.6 billion in real terms by 2023–24. After hitting an 11-year peak in early 2018, zinc prices declined in the second half of 2018. Prices are expected to rebound modestly in the near term, as fears ease over both oversupply and trade tensions. Prices are expected to slowly ease over the outlook period, to average US$2,775 a tonne in 2019 and further to US$2,353 a tonne in 2024, in real terms. Australia’s output is expected to lift over the outlook period, as production ramps up at the re-opened Century mine in Queensland, before declining again as the Lady Loretta mine in Queensland reaches the end of its life. Export volumes of ores and concentrates are forecast to decline from 2.6 million tonnes in 2018–19 to 2.4 million tonnes by 2023–24. 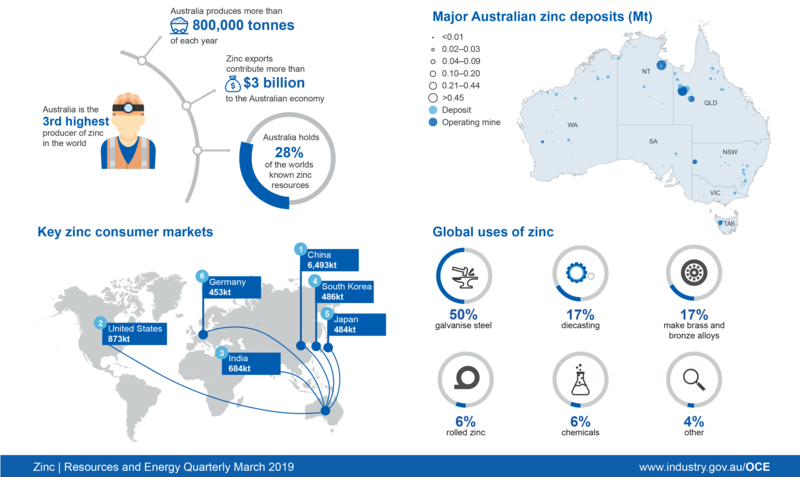 The real value of Australia’s zinc exports is projected to decline from $4.2 billion in 2018–19 to $2.7 billion in 2023–24 due to softer prices. 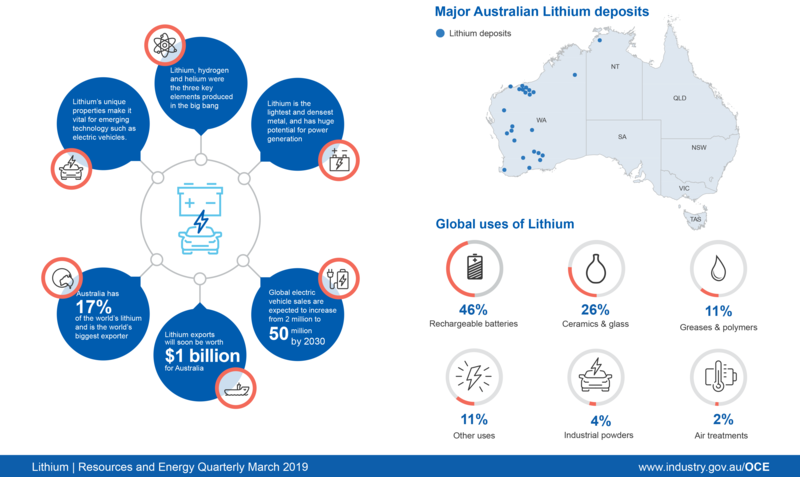 Australian lithium production is expected to increase from 251,000 tonnes (in lithium carbonate equivalent terms) in 2017–18 to around 419,000 tonnes by 2023–24, as the Greenbushes mine is upgraded and several newer mines ramp up. 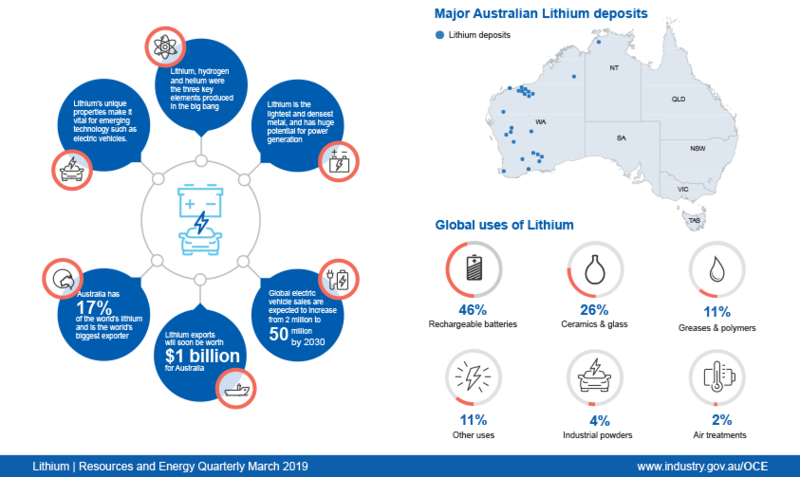 The lithium hydroxide price is expected to ease back from $US16,139 a tonne in 2018 to around $US15,600 in 2019 (in real terms). Prices are expected to fall further by 2021, before recovering to around $US13,700 a tonne by 2024. Rising production and new value-adding refineries are forecast to push export revenue up from an estimated $1.0 billion in 2017–18 to $1.5 billion in real terms by 2023–24.